At first thought, a vegetarian ketogenic diet is not only a mouthful but also seems a bit overwhelming. You think to yourself, If I do this, is there anything I can eat? Like any new eating plan, it can take a bit to get into a groove, but yes, there is plenty for you to eat if you take the time to prep a bit (and there are plenty of benefits—including lowering your chances of heart disease and type 2 diabetes). As we've already discussed, a keto diet is a way of eating that reduces the amount of sugar in your body. 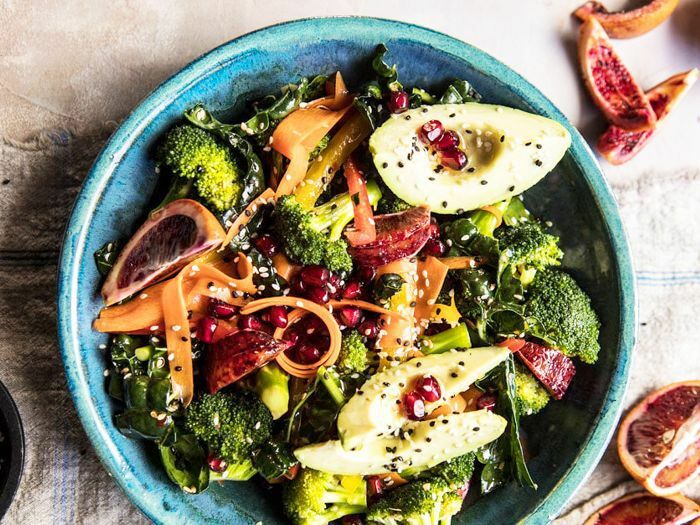 "Almost every cell in our bodies can use two fuel sources, glucose (sugar) and ketones (fat)," Maria Emmerich, author of The 30-Day Ketogenic Cleanse, has told us. "This diet restricts carbohydrates so that it switches to using fat as its primary fuel." Instead, you focus on eating high-fat foods, and your body ends up burning the fat instead of sugar. Since meat and fish tend to be go-tos on a traditional diet, what do you do when you decide to go vegetarian at the same time? The vegetarian ketogenic diet conundrum doesn't have to be as challenging as you'd imagine. "The key is to swap out your starchy veggies for low-carb alternatives while also filling your diet with plenty of plant-based fats and proteins," says Josh Axe, DNM, DC, CNS. "This can help you stay under your carbohydrate goal and provide your body with the important vitamins and minerals that it needs to stay healthy." So go on—keep reading to see how you can have the best of both worlds with a vegetarian ketogenic diet. If you're not eating meat or fish for mains, you might tend to get pretty hungry. Plus, you need something protein-packed to keep your body going. Tofu—a soybean alternative to meat—is a pretty good alternative. Fun fact: If you're not a big fan of the softer texture, you can actually change that by freezing the tofu first, and then pressing it. (Genius, right?). Other meat-free options include tempeh (fermented soy with a grainier texture) and seitan ("wheat meat"). Let eggs become your new go-to. Just one egg has fewer than one gram of carbs and less than six grams of protein, which makes it a good option (even as your main dish). Also, eggs set off hormones that make you feel full, which is why you often don't find yourself craving your next meal an hour or two after you eat them. An added perk? They contain nutrients that help keep your eyes and heart healthy. It's not just what you eat, but how you cook your food (and in what). In order to get the right amount of fat into your diet without meat, it's important to include plant-based fats. Axe suggests incorporating avocado, coconut, olive, and MCT (medium-chain triglyceride) oils into your diet. Coconut oil is likely your best option since research shows it may help you stay in ketosis longer and it targets belly fat at the same time. Since you are eating a very specific diet that weeds out carbs and all forms of meat, it's best to be a little more conscious of your vitamin intake. The trick is keeping tabs on B12, calcium, iron, and zinc. For B12 and calcium: Eggs and cheese (particularly feta) will be helpful. For iron and zinc: Try to eat more spinach, spirulina, pumpkin seeds, and cashews. For iron: Have more leafy greens, broccoli, and peppers (they help you actually absorb more iron from your meals). And if you're stumped as to what to eat on a vegetarian ketogenic diet, try whipping up grain-free granola for breakfast (sans honey), a tasty broccoli salad (with keto-friendly soy sauce) for lunch, and zucchini noodles with coconut-curry salmon for dinner.